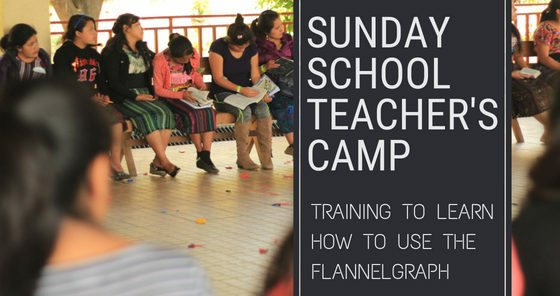 The main focus of this camp was to learn more about the flannelgraphs. Hermana Ester helped us with this first training. She has more than 28 years of experience teaching others with this amazing tool. She was the main trainer for this Camp. She taught them about the importance and the right way to use this tool and what you can achieve using this tool, if you use it correctly. Everyone was very excited about this new tool. She finished her training session with these words “with great tools comes great responsibility” to encourage them to give the best to the Lord. You just need your Bible! Another big part that we include in our camp was the importance of reading the Bible and Pastor Emilio helped us with a great workshop about how to study you Bible. In all these years that Mission Bethel has been training teacher for the Sunday School program, they saw that a lot of the teachers struggle a lot trying to prepare a class for their kids when they don’t have an extra teaching material. Pastor Emilio said many times “You just need your Bible and the guide of the Spirit”. The teachers had the opportunity to learn how to start a Bible study. The importance of putting in to practice what you are studying in your Bible. How to apply to your life what the Bible says and the great responsibility of teaching others. The best part of it was that they could see that they can do a great Bible study just using your Bible and the guidance of the Holy Spirit. The Camp started Saturday morning with a potluck breakfast. The main idea behind this was to introduce the teachers of the Cold land with the teachers of the Hot land. Praise the Lord this helped them a lot to break the ice and to make new friends. David started the activity with Choreographies, games and different activities to shake their fear and shame. Something that everyone enjoyed a lot was the fact that you can teach the Gospel through different ways. Elena followed with a great devotional using a flannelgraph where she taught us about the life of Timothy and how Paul prepared him to teach others about the good news. After they had a workshop where they learned about new games and dynamics to learn Bible verses, Bible characters and much more. Hermana Ester started with the first of her two training sessions where she talked about the Flannelgraphs. The first one was in the morning and was an introduction to the Flannelgraph and the second one was in the afternoon and was about the correct use, techniques, methods and demonstration of how to use the flannelgraph correctly. Pastor Emilio followed the conference with a Bible study about how to use your Bible. In the evening Pastor Emilio conducted the bonfire. It was a great blessing to see all the teachers renew their commitment to continue teaching children about the Gospel. They finished the bonfire shedding tears of joy marking the end of this amazing day. We had our devotional very early in the morning on the lake shore. We learned and meditate about the book of Deuteronomy 6 and how the Lord send us to search His word at all times and the most important is to love him with all our heart, with all our soul and with all your strength. Elena was in charge of the last training session. She took the challenge to teach them about the importance of the Sunday School and who established. This was a phenomenal way to finish this great camp because they learned that this is a Lord´s command. This is not something that comes from Bethel Church in San Pedro or from pastor Emilio, they now know that it was our Lord that sent us to teach the Gospel. We are very thankful with the Lord and with you as part of Proyecto Fe for making this kind of activities possible. You need to know that we appreciate this wholeheartedly for the effort that you do to find sponsors for these activities. The teachers told us that this camp changed their lives and not only that, they let us know that they want to give their best effort to serve the Lord through the children´s ministry. In behalf of each of us who are part of this Mountain Ministry we say: THANK YOU VERY MUCH AND GOD BLESS YOU!